“Chris,” I hear you say, “You’re already writing 50,000 words this month! And now you’re writing extra for blog posts too, are you mad?” Well, yes I am. But this is also a good thing. This will allow me to step back and analyse my own performance, as well as letting me step away and write something other than my novel. So, on with the show. 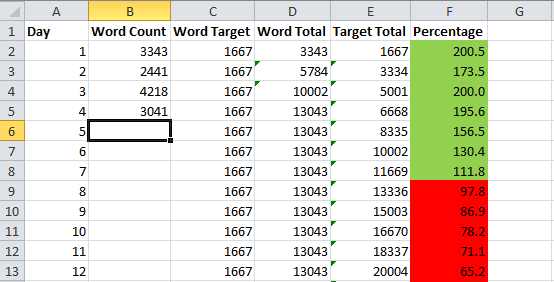 Four days and 13,043 words in, it’s hard to not feel good about this year’s NaNoWriMo. Of course, by this point last year I was pretty confident, but not like this. Last year, I was struggling to hit 2000 words a day, whereas this year, things are shaping up like this. I’ve been managing to write in the afternoons, finishing up by around 6-7 each day, giving myself time to relax in the evenings, whereas last year, the 2000 words would regularly take me from around 4 in the afternoon until 11 at night or after. So, what am I doing differently? I think the most important difference is the month I spent planning. Before this, I was always the guy who’d do things by the seat of my pants. It’s not a bad way to write. Hell, I picked it up from Stephen King’s On Writing, and if any writer can be called successful, it’s him. I just wish I hadn’t taken so long to realise I’m not him, and his writing style isn’t for me. The thing is, to use a bad metaphor, writing is like driving. And driving on the motorway is boring. It never twists and turns, there’s never any surprise or fun to it. I always equated planning to motorway driving. So last year, I set out on the motorway for the first two days, but by the third I was saying “Hey, wouldn’t it be fun if we took this turnoff down this windy country road?” And it was fun, at first. I introduced new characters and concepts, but I had no plan to fall back on. I lost my way back to the motorway, the story got out of my control, and I crashed it into a tree at the 17,000 word mark, never to return to the wreckage to salvage something. So this year, I’ve planned my route in advance. I have a lovely document on my hard drive which serves to show me the direction I’ll be taking. I have my beginning, my end, and the story tentpoles (or junctions, if you will) to keep the whole thing on track. I admit, I hit my second day and started going, “Hey, the motorway’s so dull, wouldn’t it be cool if we took this turn off down this cool, windy country road?” And it was fun. But this time, I always knew where the motorway was. After my slight detour, I was able to get back to the thrust of the story. I now have more characters involved, and a world that’s better fleshed out, but everything’s proceeding like planned. Will all this stuff survive editing? Maybe not, but I think my story’s all the better for having planned it out in advance. The other big difference is that I’m not doing this alone this year. Last year, I locked myself into my room and tackled this thing by myself. I had friends around me to talk to, but none of them were crazy enough to join me on this endeavour. This year, I’ve built a comfort blanket around myself by seeking out communities of equally crazy people. The largest and most helpful is the NaNoWriMo subreddit, with their word count tags providing another source of inspiration to keep churning out words. It’s added an element of competition to the whole thing, with me looking to claim the 10k-15k tag before the majority of people around me. Hoping tomorrow allows me to hit the 15k-20k tag. And that’s how I’m signing off. With a promise to keep this up, for the rest of November and beyond, until this story is finished. This entry was posted in Writing and tagged Fiction, nanowrimo, novel, Stephen King, Stories, write, Writing by Chris. Bookmark the permalink.